The Prime Minister has said that his recent phone conversation with US President Donald Trump was an elevation of Thailand’s relations with the US in all dimensions while affirming the Kingdom’s peaceful stance towards solving world issues. 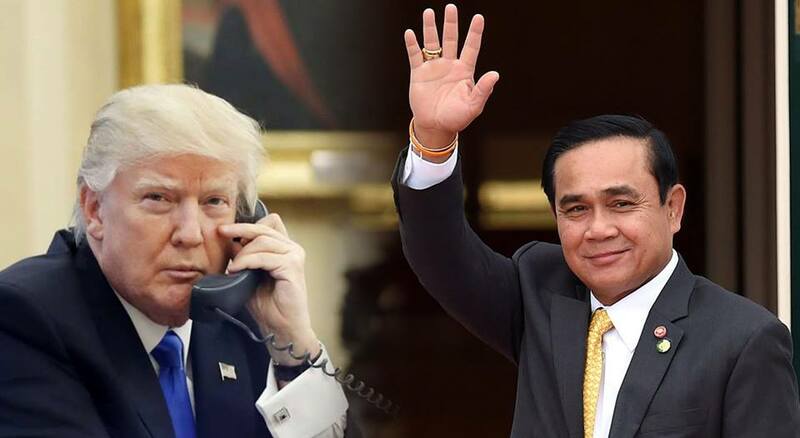 PM Gen Prayut Chan-ocha has revealed the details of his phone conversation with US leader Donald Trump, who called the premier on April 30. He let on that President Trump lauded the work of the Thai government before discussing areas such as trade, relations and the Korean Peninsula. The two ended the conversation by extending mutual invitations. Gen Prayut stated it is the government’s policy to maintain peaceful relations with all nations, including world powers, and that it will support the actions of the United Nations and ASEAN taken in relation to North and South Korea. His remarks were echoed by Foreign Minister Don Poramudwinai, who said Thailand intends to keep in step with UN and ASEAN approaches. His office and the its US counterpart are likely to meet on May 5 for more in-depth discussions.